OXFORD, Miss. – Under powder blues skies Saturday in the Grove, Walter Isaacson stressed to the University of Mississippi’s graduating class that being smart is only part of success, and that life’s greatest achievements come from collaborating to connect the arts and sciences with humanities and engineering. Isaacson, acclaimed biographer, professor and historian who also was head of both CNN and Time magazine, spoke to the graduating class of more than 5,300, including more than 1,300 August degree candidates and nearly 700 who finished in December. His talk about the need to surround oneself with people from many backgrounds to forge innovation also was peppered with the refrain of “what we forgot to tell you” to impart wisdom he’s acquired since he graduated. “You are hereby certified by this university as being very smart,” Isaacson said. “That’s the good news. The bad news is that you’re about to find out that smart people are a dime a dozen. A crowd of more than 15,000 people gathered in the Grove to hear Isaacson, a professor of history at Tulane University in New Orleans, where he grew up. He’s a graduate of Harvard College and also Pembroke College of Oxford University in Oxford, England, where he was a Rhodes scholar. He began his career at The Sunday Times of London and then the New Orleans Times-Picayune. He joined Time in 1978, working as a political correspondent, national editor and editor of digital media before becoming the magazine’s editor in 1996. In 2001, he became chairman and CEO of CNN, and then president and CEO of the Aspen Institute in 2003. Besides having headed two of the world’s most important media organizations, Isaacson is a prolific biographer and nonfiction writer. He is the author of the best-seller “Steve Jobs” in 2011, as well as biographies of Albert Einstein, Benjamin Franklin and Henry Kissinger. His most recent work, “Leonardo da Vinci” (Simon & Schuster), released in October, offers new discoveries about the artist’s life and work, weaving a narrative that connects his art to his science. He cited lessons from the figures he’s written about; most prominently that that they all found ways to innovate, not only through a tireless curiosity, but through bridging sciences, humanities and the arts. Society has forgotten to tell students that creativity comes from working across disciplines, Isaacson said. Loving everything from art and anatomy to geology and zoology and understanding the patterns across different disciplines of arts, sciences, humanities, social sciences and engineering just as da Vinci did is critical, he said. The late Steve Jobs, visionary leader of Apple, always ended his project launch presentations with slides of street signs showing the intersections of the liberal arts with technology, or the humanities with engineering. He said at those intersections is where creativity occurs. Passionate curiosity is a common trait of historical figures such as Jobs, da Vinci and others he’s written about, Isaacson said. Both Einstein and Da Vinci, some 400 years apart, wrote the same simple question in their notebooks: “Why is the sky blue?” They wondered about it and did experiments to try to figure it out. They both were driven purely out of a sense of wonder. Working with others, especially from diverse groups, is also important. He noted that for many, the university is the most diverse place they’ve ever been. People from many countries and economic backgrounds live and attend classes together, all learning ideas from across the academic spectrum. He urged students to go about the rest of their lives seeking out opinions and ideas of others who aren’t like them. Graduates are also often told it’s time to “grow up” when they leave college. Not so, Isaacson said. The central point of Bob Dylan’s “Forever Young” was the benediction he gave the Commencement crowd. UM Chancellor Jeffrey Vitter said it is an honor to welcome Isaacson, who played a major role in the success of the university’s inaugural Tech Summit in 2016, back to campus on such an important day. 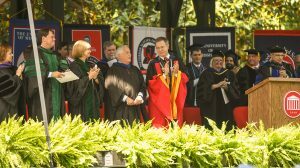 Vitter, presiding over his third Ole Miss Commencement, stood before the graduates and paused to snap a panoramic photo of the crowd, which he posted to his Twitter account. It’s a tradition he’s carried on each year since 2016. He noted the importance of the day to the graduates and wished them well in their future endeavors. 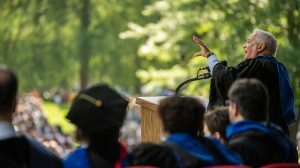 The university’s Sally McDonnell Barksdale Honors College conducted its commissioning ceremony Friday afternoon, and recipients of doctoral degrees were honored at a hooding ceremony that evening, both in the Gertrude C. Ford Center for the Performing Arts. During Saturday’s ceremony, Ann Monroe, assistant dean and associate professor of education, was introduced as the 2018 recipient of the Elsie M. Hood Outstanding Teacher of the Year Award, the university’s highest campuswide honor for teaching. Marc Slattery, professor of biomolecular sciences in the School of Pharmacy and research professor in the Research Institute of Pharmaceutical Sciences, was named the recipient of the university’s 11th Distinguished Research and Creative Achievement Award. The university also recognized the winners of this year’s Frist Student Service Awards: Kerri Scott, instructional associate professor of chemistry and biochemistry and associate director of the university’s forensic chemistry program; Leslie Banahan, assistant vice chancellor for student affairs; and Ryan Upshaw, assistant dean for student services in the School of Engineering. The university also honored former U.S. Sen. Thad Cochran with its Mississippi Humanitarian Award, which is presented only rarely to exceptional figures who have shaped the state. Vitter noted that Cochran, who was unable to attend the ceremony, played a vital role in supporting the university’s research venture and also championed many programs that have improved life for Mississippians. 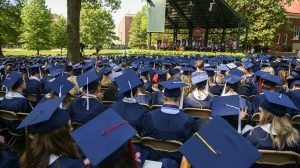 Bobby Bailess, of Vicksburg, president of the Ole Miss Alumni Association, welcomed the graduates as alumni. Guy Fortenberry Thornton, UM senior class president, talked about the senior class project, which raised $27,000 for the William Magee Center for Wellness Education as a defining experience for his time at Ole Miss. He also challenged his fellow graduates to reflect on their own time on campus as they age. He told them that over the years, the wrinkles will come, but it’s nothing to worry about. “In the wise words of Jimmy Buffet, the singer and songwriter, who once said, ‘Wrinkles will only go where the smiles have once been,’ I know I will have many of these wrinkles from all of the good times and the smiles I’ve had with all of you these past four years,” Thornton said.